Home › Toys › Remote Control Building Kits For Kids - Rc Construction Set W/ 117Pcs Buildin.. Remote Control Building Kits For Kids - Rc Construction Set W/ 117Pcs Buildin.. Batteries: 2 AA batteries required. BUILD YOUR REMOTE CONTROL CAR - It can be more easily express and develop your child's ideas and imaginations. DETAILED INSTRUCTION - This instruction with vivid diagrams can show you how to assemble a awesome remote control car or motorcycle easily. SAFE MATERIALS - Made from high quality non-toxic materials, free of phthalates, lead and other heavy-metal. Certified for EN71, EN62115, 7P, HR4040, ASTM, EMC, CD. EDUCATIONAL VALUE - Improving patience, concentration and cognitive skills. Improves kid's minds while they are having fun, makes this one of the best gifts you can give any child. HIGH PLAYABILITY - Not only children, even adult can be fascinated by this amazing building toy. You would feel high sense of achievement when you see your works start to run under you control. This Remote Control Building Kit is perfect for enhancing kidsâ€™ creativity andimproving their hands-on ability. If you are looking for some gift for kids,this could be the best option for you. 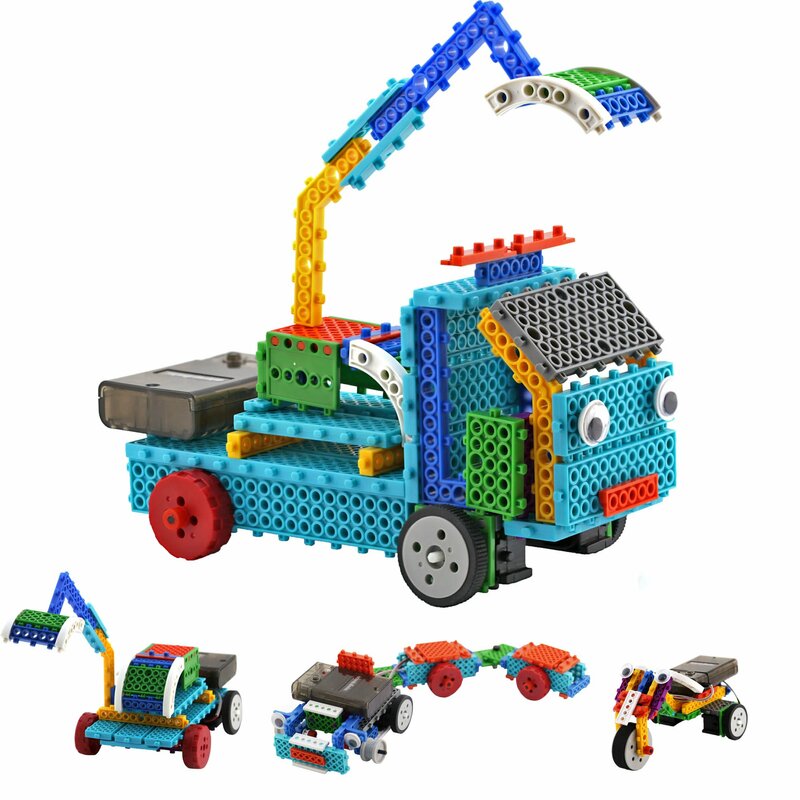 Children would love this remote controlbuilding toy, because it can be DIY and assembled to many kind of remotecontrol toy. Letâ€™s start to build your own remote control car!! Quick-start ofremote control building block: Step 1: Turn on the power button on buildingblock; Step 2: Press the â€˜F4â€™ button on remote control to finish theconnection; Step 3: Now start to control you building block! Package Included:â€¢ 117 pieces building blocks â€¢ 38 full-color pages manual â€¢ Motors2,Mainboard1, Remote Control1 Manufacturer Recommended Age: 8+ Important! 1.This remote control building set requires 2 AA batteries (remote-control) and4 AAA batteries (mainboard) - Not included 2. We would like to recommend youto race your building block car on smooth ground for the better experience.